Looking for a dog that can tolerate the most curious, most annoying kids? Meet the friendly, gentle Beabull. Also called a Bulldog Beagle Mix, the Beabull makes an excellent pet for families with kids of any age. Let me give you a crash course on this loving crossbreed. What is a Beabull dog? What does a Beabull look like? What is the energy level of a Beabull? Is training a Beabull difficult? What should I know about the Beabull’s health? Where can I find Beabull puppies for sale? When is the best time to bring home a Beabull puppy? The Beabull is the cross between the English Bulldog and the Beagle, two of the most popular breeds today. The Bulldog and Beagle mix is becoming just as well-known among pet owners because of its even temperament. Like Bulldogs, Bulldog-Beagle crosses are mild-mannered and calm. Beabulls are kid-friendly dogs, showing patience and affection even with the youngest children. Bulldog-Beagle hybrids are also playful and eager to please due to their Beagle parentage. Beagle and Bulldog mixes are companion dogs that are extremely devoted to their families. The crossbreed is adaptable to a wide variety of living situations; a Bulldog-Beagle will be as happy in an apartment as in a house with a backyard. Whether your family is highly active or laid-back, a Beagle and Bulldog cross will fit right in. The Beagle-Bulldog mix has the strong, lean, barrel-shaped body of the Bulldog, with the long muzzle and droopy ears of the Beagle. Most Bulldog and Beagle mixes also inherit the Bulldog’s underbite and wrinkles. Since neither the Bulldog nor the Beagle is particularly large, you can expect the Bulldog and Beagle mix to be a small dog as well. Full grown, the Beabull can reach a height of 12 to 16 inches (30 to 40 cm) and weigh between 30 to 60 pounds (13 to 27 kilograms). Sometimes, you’ll find smaller Beagle-Bulldog puppies that are marketed as ‘mini Beabulls,’ ‘toy Beabulls,’ or ‘teacup Beabulls’. These pint-sized dogs are most likely bred from mini or teacup English Bulldogs or so-called Pocket Beagles, which nowadays are simply Beagles that are smaller than the standard. No matter its size, the Beagle Bulldog Mix has a soft coat that’s usually coarse on top. Common coat colors for this crossbreed include white, brown, merle, speckled, brindle, golden, and spotted. The Beabull has a medium energy level, so it’s a great dog for people who can’t keep up with an excitable, high-energy pet. 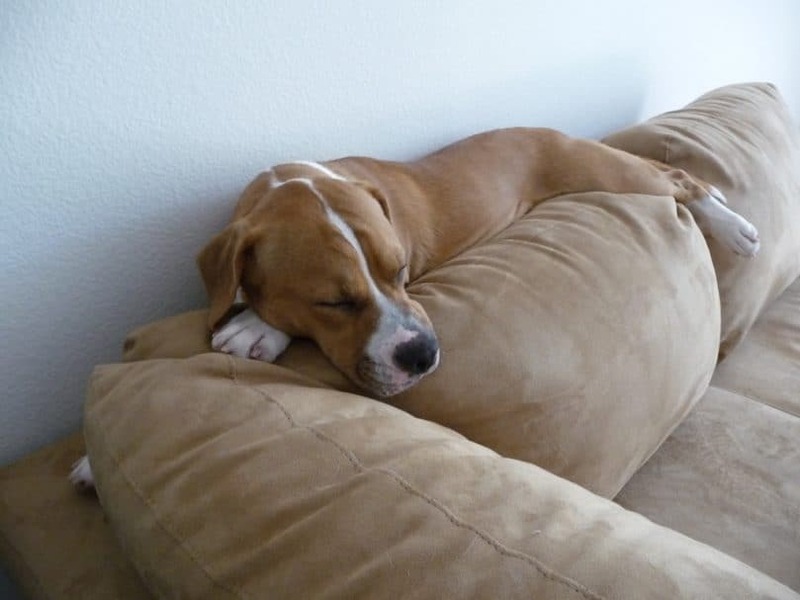 The Bulldog Beagle mix usually enjoys lazing around all day and will experience occasional bursts of energy. The Beagle-Bulldog hybrid needs 40 to 60 minutes of exercise each day, whether it’s a leisurely walk around the neighborhood or a quick visit to the dog park. Bulldog Beagle mixes also love to play fetch and hide and seek, so you can keep your dog happy even when you’re staying indoors. Beagle-Bulldog hybrids enjoy mentally stimulating tasks and challenges, so these dogs are generally easy to train. However, these hybrids can also inherit the Bulldog’s stubborn streak. The Bulldog Beagle mix responds best to positive reinforcement, especially when its favorite food is used as a reward. You’ll have to keep training sessions short and interesting to make good behavior stick. As with most dogs, it’s best to socialize Beabulls with people and other animals at an early age. This way, you can prevent problems with aggression as your dog grows up. Bulldog Beagle mixes may occasionally engage in play-biting, especially when they’re exploring the world as puppies. Unfortunately, these nibbles can turn out to be quite painful, especially since most Beabulls inherit the strong jaws of their Bulldog parents. One way to discourage biting in your Beabull is to stop playing with the puppy as soon as it uses its mouth on your skin. You can also give your dog chew toys, so it learns to bite only appropriate objects. Despite their docile nature, Bulldog-Beagle mixes tend to howl, a trait they get from the Beagle. 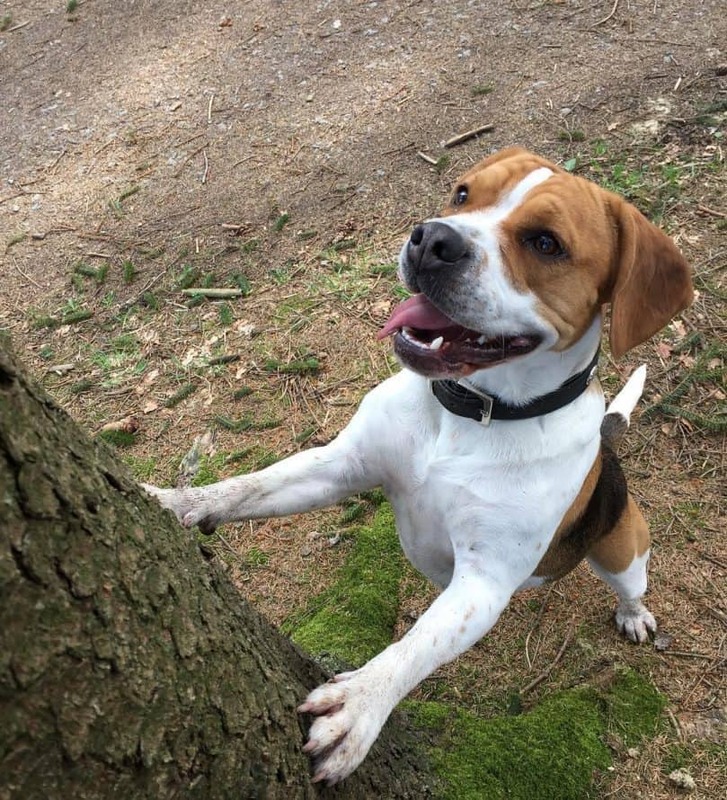 Your Bulldog Beagle cross will usually howl out of boredom or separation anxiety. You can keep your Beagle-Bulldog mix occupied by taking it for a walk or playing fetch. The Bulldog and Beagle mix will also enjoy mental challenges such as hide and seek and scent-oriented puzzles, so you can use these games to keep your Beabull’s howling under control. The Bulldog Beagle Mix has an average lifespan of 10 to 13 years. Like with most dogs, certain health issues may affect the lifespan of a Bulldog Beagle mix. Many Beabulls suffer from brachycephaly, a shortened facial structure that causes breathing issues and other health problems. This condition is common among Bulldog breeds and their crosses. The Frug, a French Bulldog and Pug mix, for instance, is a brachycephalic breed as well. Due to this condition, most Beagle-Bulldog hybrids must be closely supervised during exercise and kept indoors during hot weather. Aside from brachycephaly, Bulldog Beagle mixes may be prone to digestion problems, hip dysplasia, and intervertebral disk disease. These crossbreeds may also inherit a predisposition to hypothyroidism and eye problems due to their Beagle parentage. Most Bulldog Beagle mixes have a voracious appetite, like the English Bulldog. No matter how much your dog may beg, keep its diet restricted to 3 to 4 cups of dog food every day. Monitoring your Beagle-Bulldog cross’ food intake is crucial because this hybrid is prone to obesity, like its parent breeds. If your Beagle and Bulldog crossbreed has an underbite, put his food in a shallow, wide bowl. This will make it easier for your dog to eat. Most Beabulls are heavy shedders, especially in the spring and fall. During these seasons, you may need to brush your Beagle-Bulldog mix as much as 3 to 4 times a week to get rid of dead hair and keep its coat shiny. You can save some effort in removing loose hair from your Bulldog-and-Beagle mix by running a vacuum cleaner over its coat. Just make sure you use the proper pet grooming attachments for your vacuum cleaner, so you don’t end up hurting your dog. These crossbreeds may inherit the Beagle’s double coat, which makes frequent brushing even more important. Removing dead fur ensures that the Beabull’s new undercoat can grow in properly. Due to its heavy shedding, the Bulldog Beagle Mix is not a hypoallergenic breed. Aside from its coat, you’ll also need to pay attention to your Beagle-Bulldog’s ears and folds. You can clean your Bulldog and Beagle mix’s folds with cotton balls and peroxide at least once a week. Don’t forget to wipe your dog’s ears with a damp cloth once a week to remove debris. Your Bulldog and Beagle mix is prone to skin infections and dryness, so it’s best to bathe your dog only once a month. If you feel like your Beagle and Bulldog crossbreed is getting too dirty between baths, you can wipe over its coat with a damp cloth. Make sure you visit the breeder before you make any purchase. 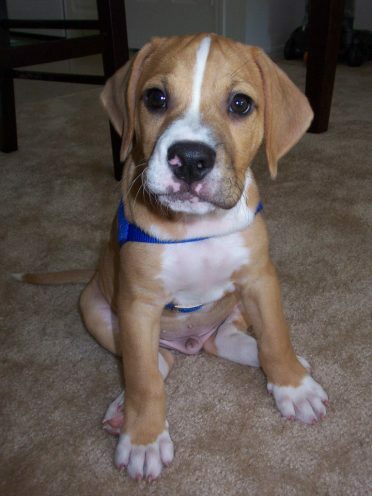 Beagle-Bulldog mix puppies should be kept in a clean and comfortable environment. Stay away from breeders who refuse to show you where the puppies live. Reputable Beabull breeders will have also tested each litter’s parents for common health issues such as patellar luxation, hip and elbow dysplasia, and vision problems. The best time to bring a Bulldog Beagle mix puppy home is when it’s 8 weeks old. At 8 weeks, Beabull puppies enter their last stage of development and can be safely weaned from their mother’s milk. This is a great time to start potty-training your Bulldog and Beagle mix and teaching it positive behavior. Keep plenty of chew toys at hand so your dog can learn which things it can sink its growing teeth into. You may also have to do some puppy-proofing around the house since your young Beagle-Bulldog hybrid will want to explore everything in its new environment. The Beabull is a friendly, docile dog that’s also intelligent and eager to please. Its affectionate nature and tolerance of curious young children make it an excellent pet for any family. The Bulldog Beagle mix’s moderate energy levels are also great for people who want a more laid-back pet. However, the Bulldog and Beagle Mix also needs a considerable amount of maintenance, as this crossbreed sheds large amounts of fur in the spring and fall. You’ll also have to train your Beabull to keep its play-biting and howling under control. Leave a comment if you think your family’s ready for a Bulldog Beagle Mix!